Moist von Lipwig, the savior of the Ankh-Morpork post office, has gotten settled into a routine. He's filling out forms, signing things, will probably get to be head of the Merchants Association next year, and he hasn't designed a stamp in months. He's so bored, in fact, that he's taken to climbing the walls of the post office and breaking into his own office. Lord Vetinari, always brilliant in his ruthlessness, recognizes an opportunity when he sees one, and offers Moist the job of running the royal mint. Moist tries to refuse, pretending that he's satisfied with the stable life, but he can't deny the urge for adventure and intrigue for long. The mint is, in the finest Ankh-Morpork tradition, a strange and oddly old-fashioned place, with bizarre traditions so ingrained the long-term employees can't imagine doing them any other way. Moist is the perfect innovator, with his wildly creative solutions to problems, for changing the way the entire city thinks about money. In the transition from the gold standard and old money, Pratchett brings up all the details that make Ankh-Morpork one of the most satisfying contemporary fantasy cities and continues in his trend of beautifully crafted, wickedly cutting satire on the underpinnings of modern human society. Making Money is smart, funny, and a thoroughly entertaining read. I adore Terry Pratchett. I love the way he layers each of his Discworld books on top of the previous ones, somehow managing to keep a huge cast of characters straight, complete with hilarious personalities, species-specific customs and habits, and the mythologies of God knows how many gods. To call him a "fantasy" author is probably unfair as many people (sadly) look down on fantasy as a genre and have probably never ventured into those aisles at the bookstores. But Pratchett, much as he deals with vampires and trolls and golems and dwarfs in his novels, is a satirist. Every Discworld book has a plot that pokes fun at and mimics our world, and that's what makes them brilliant. If you are the sort of person who enjoys The Daily Show or The Onion, I think you should give Pratchett a try. He's amazing, and prolific. And, sadly, suffers from early-onset Alzheimer's. Obviously, it's sad when anyone suffers from this disease, and it's no more or less sad when it happens to an author. But for someone who is so gifted and clearly adept at remembering all sorts of things about all sorts of people, it must come as a painful blow. Luckily for Pratchett's wide readership, he seems to be in full control of his faculties while writing. In Pratchett's most recent novel, he takes on the banking system (timely, timely, timely! ), greedy rich people and depressed accountants. Gosh, sounds like my life :-) And, as ever, he delivers with style. This book gives us a closer look at the Patrician of Ankh-Morpork, Lord Vetinari, whom I have always found fascinating. Also making brief but perfect appearances are Captain Carrot, Corporal Nobbs, my personal favorite Death and Cut-Me-Own-Throat Dibbler. The scene-stealer in this one, though, is Gladys the Golem. Or is it Mr. Fusspot, the randy, drooling dog? It's so hard to decide! 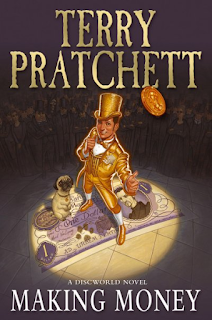 While I don't think that Making Money is as spectacular as some of my favorite Pratchett books, it's still laugh-out-loud funny and it leaves you with a feel-good warmth inside. I found some of the plot turns to be somewhat deux ex machina, but when you're having so much fun with a book... who cares? I suppose the only reason I don't think this book is up to par is because I don't like Moist or Adora Belle (what a name!) nearly so much as I like some of Pratchett's other characters. Moist is entertaining, yes, but he himself admits that he is forgettable. And Adora is just... well, she's not even really that entertaining. Also, it was just odd to see so much of the Patrician in the book. He wasn't the omniscient, terrifying tyrant in this book so much as he was just a concerned mayor trying to do his job. I really like Vetinari as a character, but I don't think he's the sort who can show up so much and retain his mystique. So, here's hoping that he returns to the woodwork and we get brief, fascinating glimpses of him from time to time in the rest of the novels. The book ends with definite room for another title in the Moist Lipwig "series-within-a-series" set of Discworld books, which I hope is in the running. But then, there are so many other Discworld characters whom I'd love to see more of- Susan Sto-Helit and Lobsang being at the top of the list. And I'm always a fan of boos in which Death has a large role. And the wizards. And, of course, the Watch. The list goes on and on. Maybe the next one will feature them all! I liked this one when I read it, I think more than Going Postal. This book sounds really fun. I have never read a Pratchett book, but really want to one day soon. There are just so many out there that I have no idea where to start! Where do you recommend I start? Btw, great review, as usual! P.S.- I ran right out and bought Fludd based on your review. Hopefully I have some time to devote to it in the near future. That's interesting, Marg. I think I liked Going Postal better. Though of his recent Discworld books, I like Thud! best. You are the first Terry Pratchett fan that I've come across!! I adore his works specially the Discworld series. I thought Making Money was definitely one of Pratchett's better works and that kind of prompted me to add Going Postal to my TBR. Did you watch the BBC adapted movie of Going Postal?